Attending memberships are $65 and include the awards banquet and all Locus events except the Writers Workshop, plus a free six-month digital subscription* to Locus. 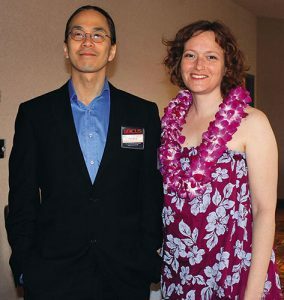 The weekend includes readings, a kickoff party hosted by Clarion West for instructor Daniel Abraham (the first of their six summer parties honoring 2018 instructors), panels with leading authors, an autograph session, the lunch banquet, and a Hawaiian shirt plus trivia contest judged by the fabulous Connie Willis, who will MC the ceremony and present the Locus Awards, a Locus celebration of our 50th anniversary, and more! Supporting memberships are $27 and include the six-month February to August subscription. Supporting memberships purchased before the price change on May 1 can upgrade at any time (until the event is sold out) to full membership for $28; purchased after May 1, upgrade price is $38. Locus Awards events will be held at the Best Western Executive Inn at 200 Taylor Avenue North, Seattle WA 98109, with excellent access to the light rail and trolley systems and directly across the street from the Seattle Center, home to the Museum of Pop Culture, which houses the Science Fiction and Fantasy Hall of Fame. Special room rates for the Locus Awards are $199. These rates will be applicable from Thursday, June 21 through Sunday, June 24. Please make hotel reservations by May 21, 2018 in order to secure the special room rate. For hotel reservations, call the direct number at 1 (206) 448-9444 and mention the “Science Fiction Awards 2018”. If you need to book additional days, please e-mail Locus or call us at (510) 339-9196 and we will try to arrange it for you. If you need to book additional days, please e-mail Locus or call us at (510) 339-9196 and we will try to arrange it for you. 7:00 p.m. to 8:00 p.m.: Readings with Connie Willis and Yoon Ha Lee. 8:00 p.m. to 11:00 p.m.: Party hosted by Clarion West for Awards Weekend ticket holders as well as supporters, alumni, and friends of Clarion West, in honor of first week instructor Daniel Abraham. 10:00 a.m. to 10:45 a.m.: “The Dread Between! How to create and sustain momentum in your stories and your careers” panel with Greg Bear, Daryl Gregory, Eileen Gunn (m), Beth Meacham, and Connie Willis. 11:00 a.m. to 11:45 a.m.: “Politics in Spaaaace” panel with Daniel Abraham, Fonda Lee (m), Yoon Ha Lee, Adam Rakunas, and Catherynne M. Valente. 11:00 a.m. to 11:45 a.m.: Donut Salon: “Storyskins: Titles, Beginnings, and Endings”. Meet and chat with C.C. Finlay, Mimi Mondal (m), Dominica Phetteplace, Nisi Shawl, and Jack Skillingstead, over donuts. 12:00 p.m. to 12:30 p.m.: Autographing session with books available for purchase thanks to University Book Store. Signers include Daniel Abraham, Greg Bear, Erin Cashier a.k.a. Cassie Alexander, Daryl Gregory, Eileen Gunn, Lindsey S. Johnson, Fonda Lee, Yoon Ha Lee, Ken MacLeod, Scott James Magner, Mimi Mondal, Raven Oak, Dominica Phetteplace, Adam Rakunas, Nisi Shawl, Jack Skillingstead, Patrick Swenson, Bruce Taylor, Catherynne M. Valente, Connie Willis, and more TBA. 12:45 p.m. to 3:30 p.m.: Locus Awards Lunch Banquet and Ceremony at the Best Western Executive Inn with M.C. 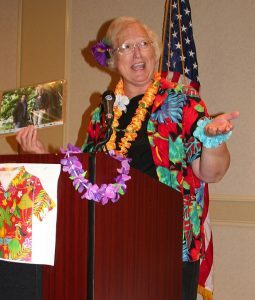 Connie Willis, who will present the awards and judge a Hawaiian shirt plus trivia contest. 8:00 p.m. to 11:00 p.m.: Locus Party, time to celebrate our 50th Anniversary! Conversation, appetizers, and a cash bar. Schedule is subject to change without notice. 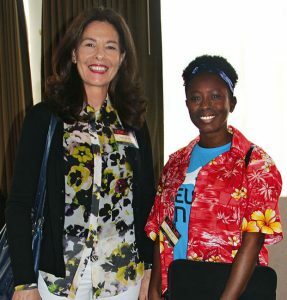 Don’t forget to wear your most outlandish Hawaiian or SFnal shirt to the Locus Awards! Thinking of attending? Please do. We encourage people of color, women, people with disabilities, older people, and lesbian, gay, bisexual, and transgender people to attend. We welcome people of any gender identity or expression, ethnicity, race, sexual orientation, age, size, nationality, religion, culture, education level, and self-identification. Locus associate editor Arley Sorg will serve as our PoC/LGBTQQIA Ombudsman. He will be on-site for questions, concerns, conversations, and more. Feel free to reach out to him in advance at locus@locusmag.com subject: Arley Ombudsman. There are also plans for a PoC safe space. Are you a PoC thinking about attending the Locus Awards weekend? We encourage inclusivity! Locus has several sponsored memberships for PoC who may not otherwise attend the Locus Awards. Memberships include admission to many weekend events: readings, a kickoff party, panels, an autograph session, the banquet, and the awards. Memberships do not include admission to the Writers Workshop (which is ticketed separately). Hotel and transport are not included. Nisi Shawl will select recipients. Application for these sponsored memberships can be found here and will be accepted through May 31st. Application is confidential: details of applications will remain exclusively with Locus and Nisi Shawl. Applications are open to anyone who is a person of color/non-white person. By applying, you agree that your application statements are accurate and that you are a person of color/non-white person. 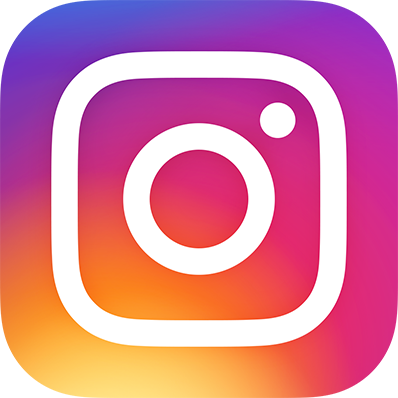 Norwescon is the Pacific Northwest’s Premier Fantasy and Science Fiction Convention and one of the largest regional Science Fiction and Fantasy conventions in the United States, next held April 18-21, 2019 at SeaTac WA. More details about Norwescon can be found at www.norwescon.org.